Rima glottidis. A. During ordinary breathing. B. Widely open. 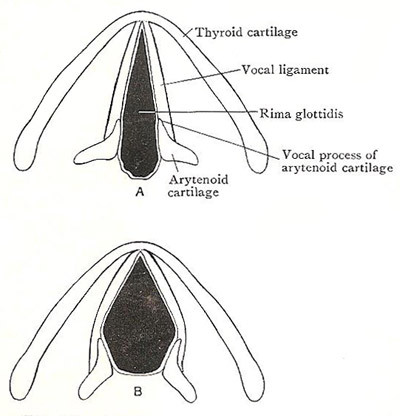 The rima glottidis is an elongated fissure bounded on each side by the vocal folds and by the vocal process and base of the arytenoid cartilage. It is a little below the middle of the laryngeal cavity, and is the narrowest part of the cavity. The part between the vocal folds is rather more than half of its length, and is narrower than the part between the cartilages. The form of the rima glottidis undergoes frequent alterations depending on what the individual is doing. During ordinary quiet breathing it is lanceolate in outline, and the part between the folds has the form of an elongated triangle with the base directed backward. When the rima glottidis is widely opened its broadest part is between the extremities of the vocal process. The two vocal folds may, on the other hand, be approximated so closely to each other, as when a high note is sung, that the part between the folds is reduced to a chink. The length of the entire fissure is about 2.5 centimeters (1 inch) in men and 1.7 centimeters (0.7 inch) in women.